An indigenously developed intermediate-range nuclear capable ballistic Agni II was successfully test-fired off Odisha coast. Agni II missile has a strike range of more than 2,000 km. New Delhi: An indigenously developed intermediate-range nuclear capable ballistic Agni II was successfully test-fired today at 8:30 am from Launch Complex-4 of Integrated Test Range (ITR) from the Abdul Kalam Island off the Odisha coast. The trial was conducted by the Strategic Forces Command (SFC) of the Indian Army as part of its user training exercise, a defence ministry official said. 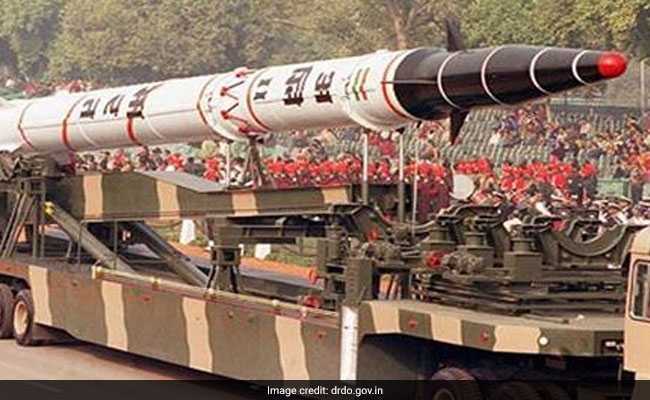 The Defence Research and Development Organization (DRDO) had successfully tested country's longest indigenously developed nuclear missile Agni-V in January and short-range nuclear capable ballistic Agni-I earlier this month. Union Ministers Suresh Prabhu and Piyush Goyal took to Twitter to congratulate the scientists on this successful development and said that Agni II would further strengthen India's defence capabilities. 1. The intermediate-range nuclear capable ballistic Agni II is indigenously made and has already been inducted into the Indian Army. 2. Agni II missile has a strike range of more than 2,000 km and is 20 metres long. 3. Agni II missile weighs 17 tonnes and can carry a payload of 1,000 kg. 4. The two-stage Agni II missile is equipped with advanced high accuracy navigation system. 5. The navigation system in Agni II missile is guided by a novel scheme of state-of-the-art command and control system was propelled by solid rocket propellant system.